Bluetooth 4.2 Paww WaveSound 2.1 uses the latest Bluetooth technology which is 250% faster and has 10x more bandwidth than Bluetooth 4.0. Connect to your devices confidently and quickly, making your audio experiences seamless. Bringing Sound to Life Enjoy TV, gaming and high-impact digital experiences by combining the CD-quality sound of aptX with the low latency of aptX LL. Paww WaveSound 2.1 is engineered to transform ordinary media into life-like sound. With an end-to-end latency of just 32ms, visual elements are synced with the supporting audio on a real-time basis making WaveSound 2.1 ideal for watching TV with. Connect Multiple Devices The Paww WaveSound 2.1 allows you to connect the headphones to two devices simultaneously. So whether you want to watch a movie on your tablet, but want to keep an eye on your phone for an important call you're expecting, or want to switch between watching TV and listening to an audiobook on your phone, the WaveSound 2.1 has you covered! Technology That Makes a Statement With a solid, clean, and luxurious build, the Paww WaveSound 2.1 steals the show. At first glance, these high-tech Bluetooth headphones look delicate, but the robust and sturdy construction is crafted to withstand years of regular use. 16-hour Playtime Count on your audio to be available when you wish. Longer playtime means less downtime, and you can dive into a great soundtrack, game, TV show or other media whenever you please. Never miss a beat with 16 hours of powerful sound quality and reliable operation. The WaveSound 2.1 headphones are more than an accessory, it's a companion. Stay Connected Effortlessly with Hands-Free Calling Be the multi-tasking pro that you are with headphones designed to simplify your calls. The built-in microphone and advanced Bluetooth features keep you connected to your Smartphone or other devices without the need to reach for your pockets. 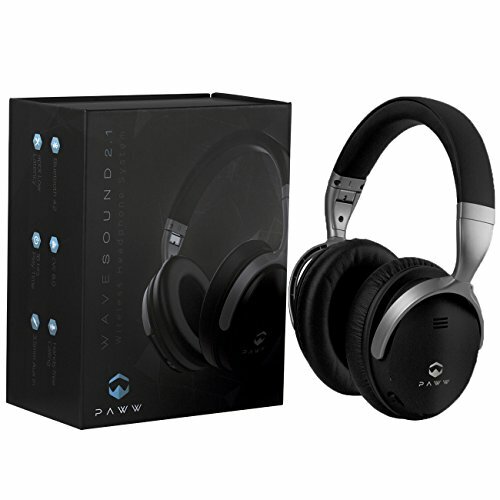 Elevate your lifestyle with the WaveSound 2.1 Bluetooth headphones from Paww. BRINGING SOUND TO LIFE - Combining the CD-quality sound of aptX with the low latency of aptX LL, Paww WaveSound 2.1 is engineered to transform ordinary media into life-like sound. With an end-to-end latency of just 34ms, visual elements are synced with the supporting audio on a real-time basis making it ideal for watching TV, gaming and high-impact digital experiences. FASTER CONNECTIVITY - Paww WaveSound 2.1 uses the latest Bluetooth technology - 250% faster with 10x more bandwidth than Bluetooth 4.0. This allows you to connect to your devices confidently and more quickly to furnish you with a seamless audio experience every time. MULTIPLE DEVICES SIMULTANEOUSLY - The built-in microphone and advanced Bluetooth features keep you connected to your smartphone or other devices. You can watch a movie on your tablet while keeping a close eye on your phone when waiting for an important call, or you can switch between watching TV and listening to an audiobook on your phone. Either way, the WaveSound 2.1 has you covered! TECHNOLOGY THAT MAKES A STATEMENT - With a solid, clean and luxurious build, these Paww headphones steal the show. At first glance, these high-tech Bluetooth headphones look delicate, but the robust and sturdy construction made using high-quality materials will withstand years of regular use. LONG PLAYTIME - You can count on your audio to be available whenever you wish. You never have to miss a beat with PAWW, delivering 16 hours of powerful sound quality and reliable operation. Longer playtime equals less downtime, allowing you to dive into a great soundtrack, game, TV show or other media any time you please. The WaveSound 2.1 headphones are more than an accessory, it's a companion. If you have any questions about this product by Paww, contact us by completing and submitting the form below. If you are looking for a specif part number, please include it with your message.